The next meeting of MVM Chippenham is on Tuesday 23rd April. We will meet at 7pm in The Swan in Bradford-on-Avon. Proportional Representation is now getting high on the agenda so come along and join in the fun! We look forward to your input into how we can help to make our democracy fit for the 21st century. Please join us for this meeting of a new MVM group in Bristol. There will be an opportunity to discuss MVM’s national summer action day taking place on Saturday 6th July, and how to win PR locally. All are welcome, from all parties and none. Come along and bring your ideas and enthusiasm! We look forward to seeing you. Join MVM Cornwall in Truro for a discussion about how to win PR locally. At the meeting you can also find out more about MVM’s national summer action day taking place on Saturday 6th July. Come along to the next meeting of MVM South West London and help get our voices heard. On the agenda is an update on MVM progress since December last year. 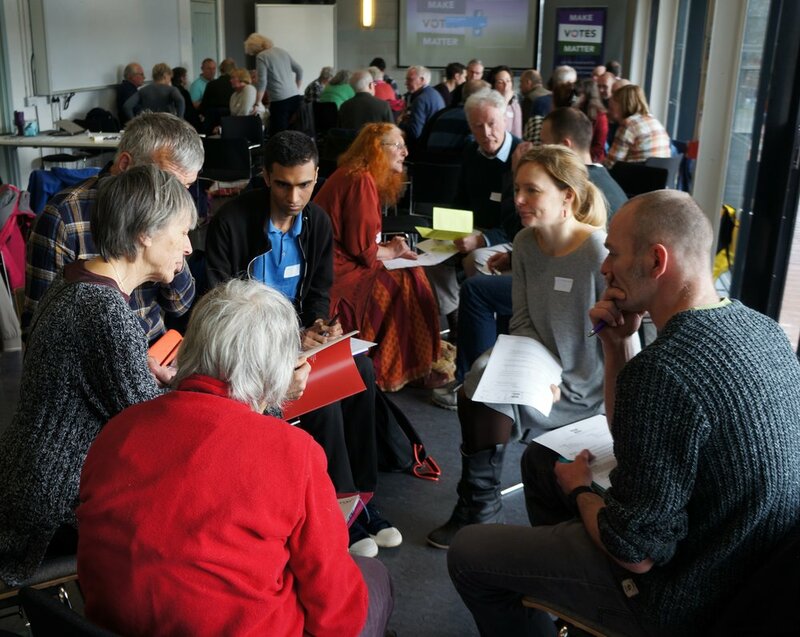 There will be a discussion about PR and Brexit and an ideas session on how to get involved in the national MVM Action Day, on Saturday 6th July. 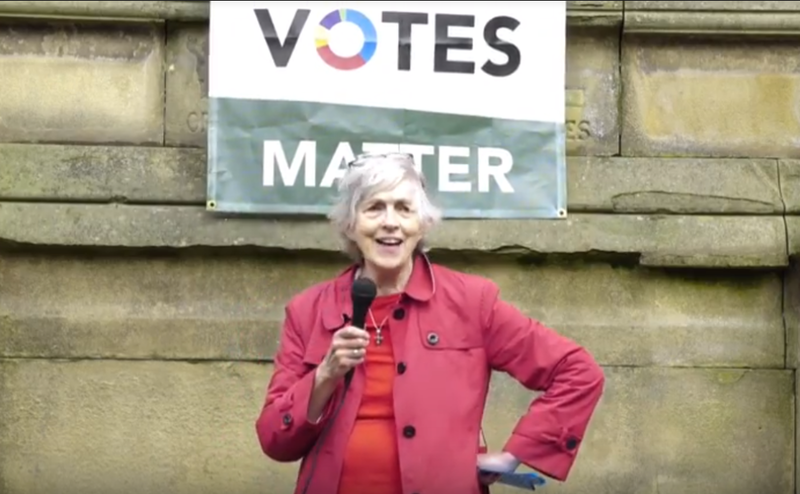 Guest speaker Mary Southcott from the Labour Campaign for Electoral Reform (LCER) will join MVM North London’s next meeting on Tuesday 9th April. Mary has been invited to say a few words about her work with LCER and will be on hand to provide helpful guidance on her experience of campaigning for electoral reform in the Labour movement. Mary has been a Labour parliamentary candidate, has held a variety of roles in the party and has spoken at a large number of local Labour Parties on electoral reform. She was also a guest panellist at Make Votes Matter’s fringe event at the last Labour Party Conference in Liverpool. How to get to the meeting: Nearest tube is Highgate (northern line) followed by a short bus ride on number 43 or 134 to Cranley Gardens. Buses W7, 102, 144, 234 & 299 also go to nearby Muswell Hill Broadway. 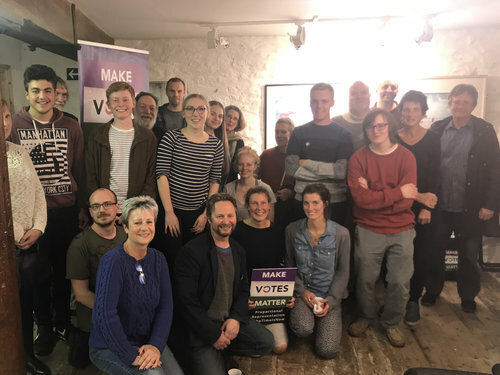 Klina Jordan, Co-Founder and Co-Chief Executive of Make Votes Matter is the guest speaker at MVM Totnes’s April meeting. Whether you’ve been to a meeting before or this is your first time, join this friendly group of PR supporters and hear about the national campaign from Klina. The campaign for Proportional Representation takes centre stage in Warrington on Saturday 30th March. So why not drop by the steet stall and find out more about how you can get involved in winning PR in years, not decades. Campaigners for Proportional Representation are holding a street stall in Totnes on Saturday 30th March. 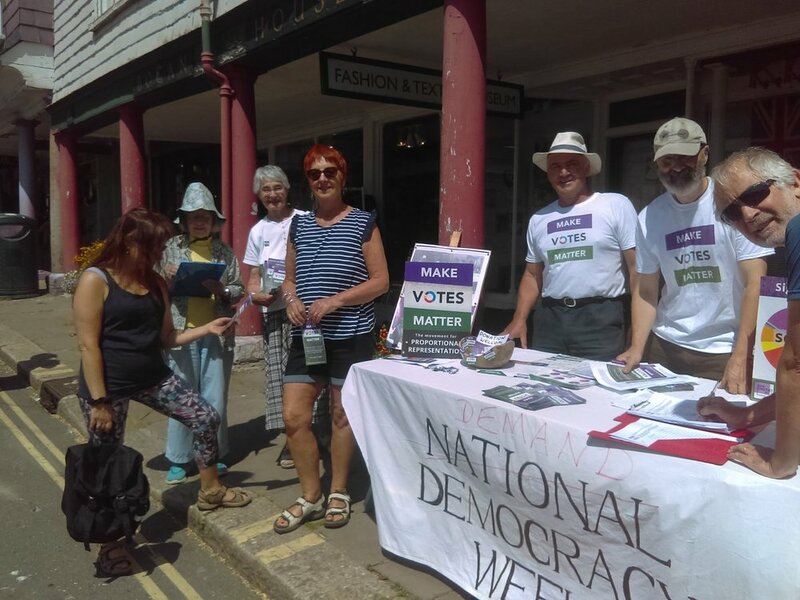 The interactive stall features a democracymeter to help pull a crowd at Civic Square, just off Fore Street in the centre of Totnes. Why not go along and pay them a visit. Join MVM North London on Tuesday 12th March for their regular meeting. The group will carry out a comprehensive review of where next with their campaigning efforts, where the north London MPs are right now on PR and how to respond. They will also be looking at how to get local parties to support PR, along with trades unions. MVM Cornwall meet in February to plan the year ahead. Please try and make it along even if you haven't been for ages or not at all, the group would love to see you and everyone is welcome. All are welcome to this meeting of MVM East London, taking place in the Marks and Spencer cafe in the Westfield Stratford shopping centre at 7.30pm on Thursday 21st February. Come and hear an update from the national campaign and find out - or help decide - what the next steps are in the East London campaign for Proportional Representation. MVM East London at a previous meeting. Join MVM Bournemouth at their monthly gathering in February. Hear updates from the national campaign and help plan activities for the coming year to win PR in years, not decades. The group is also looking for volunteers to help run some street stalls. 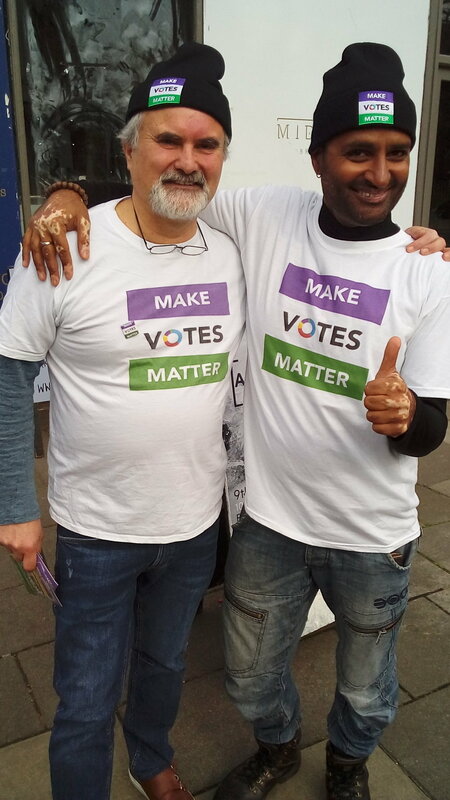 Join local Make Votes Matter (MVM) supporters for a meeting in Hereford on Wednesday 30th January. 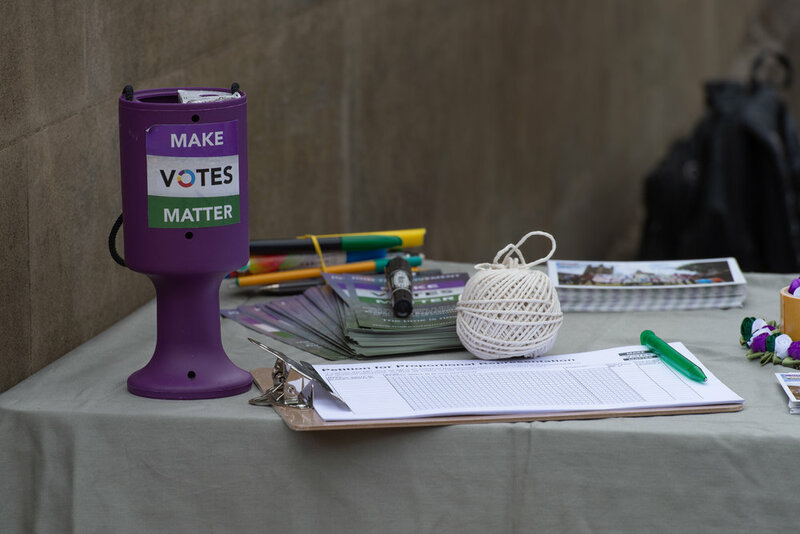 Hear about updates from the MVM national campaign, including a recent day of lobbying action in Westminster. 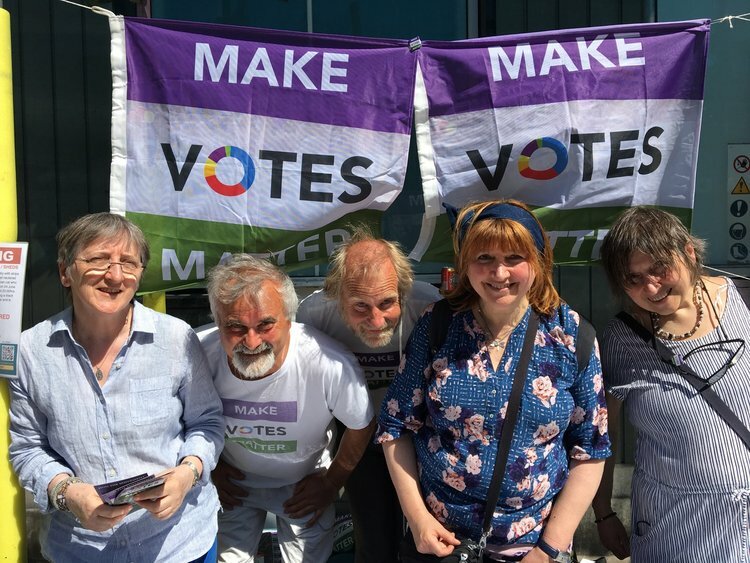 MVM Hereford will also be talking about what local action to take over 2019 to help reform our electoral system to one of Proportional Representation. The next meeting of MVM Chippenham is at the Swan Hotel, Bradford-on-Avon, on Tuesday 29th January. The group will be discussing their campaign activities for the year ahead and everyone is welcome to join them. MVM Totnes will be holding its first meeting of the year on Tuesday 15th January. Get 2019 off to a flying start by getting involved in the group’s campaign activities. Join local supporters for the next meeting of MVM Cornwall. This is a chance to catch up with all the activities of the group so far, join in, and suggest your own ideas. All are welcome. 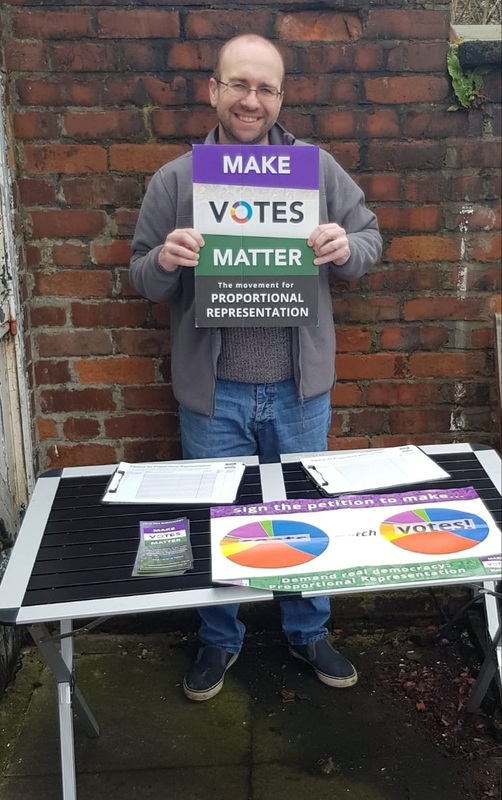 Join MVM Cheshire as they take the campaign for Proportional Representation (PR) to the streets of Warrington town centre. Drop by the street stall for a chat about PR or contact the organisers if you would like to help out on the day. Oxford MVM is having a stall at Oxford Green Fair. Please come along and see how you can get involved locally and help the group campaign for Proportional Representation. If you would like to help out on the day, contact the stall holder below. MVM Totnes hold their next meeting on Tuesday 27th November. They will be discussing plans for the People’s Lobby for PR which takes place on Tuesday 11th December when hundreds of people will descend on Westminster to lobby MPs on PR. The next meeting of MVM Chippenham takes place at The Swan Hotel in Bradford on Avon on Tuesday 27th November. The group will discuss the next national mobilisation event, the People's Lobby for PR, which takes place on 11th December. They will also be looking ahead to 2019 and would encourage as many people as possible to attend the meeting. Join MVM Cheshire outside Chester Cathedral where the group will be running a street stall. If you’re in Chester city centre that day, why not go along and have a chat or help out on the stall. Everyone is welcome. Join MVM South West London for their next gathering at The Old Ship pub in Richmond-upon-Thames. There will also be an update on progress made since June, and an opportunity to discuss MVM’s Good Systems Agreement on how to bring about PR. Everyone is welcome, whether you’ve been to a meeting before or not. 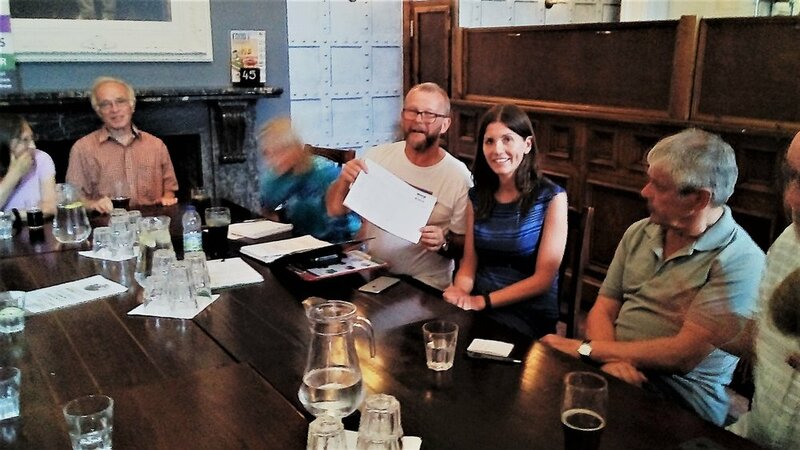 Come along to the next meeting of MVM North London and hear about our plans for the People’s Lobby for PR and how you can get involved. Everyone is welcome, whether you have attended a previous meeting or this is your first one. 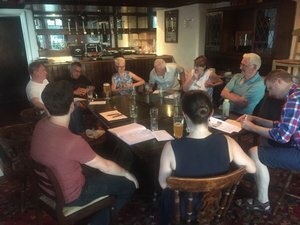 The next regular meeting of MVM Dorset, which is always held on the first Wednesday of the month, is at the Cricketers Arms pub in Bournemouth. Everyone is welcome to attend, whether you’ve been to a previous meeting or this is the first time. The meeting will be held in the Harold Wilson Room at Jesus College, Turl Street, Oxford, OX1 3DW.